Transcaval ureter is a rare condition caused by abnormality in the embryogenesis of the inferior vena cava (IVC). It results from a segmental duplication of the IVC which creates a venous ring that encircles the right ureter. It should be kept in mind as a possible cause of right hydroureteronephrosis in patients presenting with features suggestive of right ureteric obstruction. We report here a case of transcaval ureter that presented to us with bothersome right flank pain which was managed by right ureteroureterostomy. A 42-year-old female presented to us at the outpatient department with a history of right flank pain for 2 years. Pain was dull aching, episodic in nature, had no specific aggravating or relieving factor, and had increased in its intensity over the past 6 months. There was no history of associated fever, dysuria, hematuria, or any previous surgery. Examination revealed right costovertebral angle fullness but no tenderness. Her blood investigations, complete blood count, renal function test, liver function tests, urine analysis, and urine culture were found to be normal. On ultrasound scan, right hydroureteronephrosis was noted. The left kidney was found to be normal. Intravenous urography (IVU) showed right-sided hydronephrosis with dilatation of the proximal ureter up to the level of the transverse process of L3 vertebrae, suggestive of retrocaval ureter. Contrast-enhanced computed tomography (CECT) scan was done and it was reported as retrocaval ureter with proximal hydroureteronephrosis [Figure 1]a. The patient was taken up for surgery with the diagnosis of retrocaval ureter and right open ureteroureterostomy was planned. Right anterior subcostal incision was made, retroperitoneum was entered, and the right kidney with dilated pelvis and proximal ureter was identified. 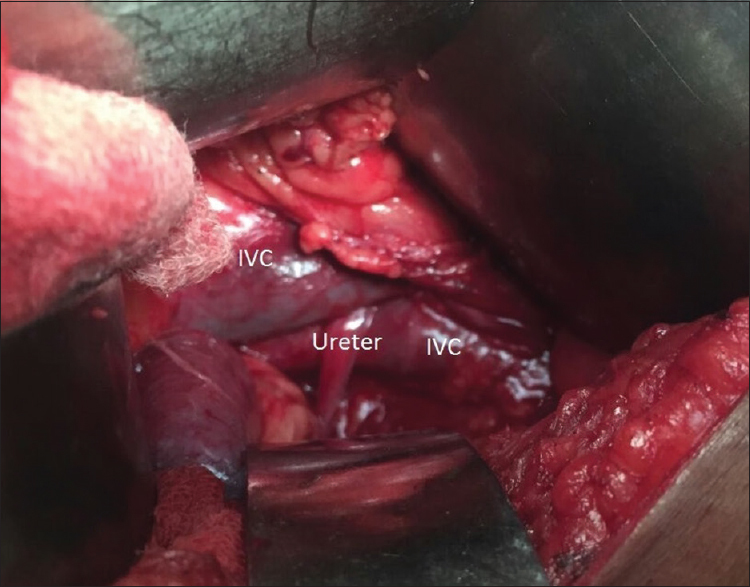 On further dissection, contrary to the report of imaging, the ureter was found to transverse in between two segments of IVC and thus on table, the diagnosis of right transcaval ureter as the cause of obstruction was made [Figure 2]. The patient underwent segmental ureteral resection followed by ureteroureterostomy. The right ureter was dissected proximal and distal to the transcaval segment, sectioned, and spatulated before executing an end-to-end anastomosis. A double J (DJ) stent was placed in situ. Pathologic examination of the resected portion of the ureter showed chronic inflammation with mononuclear cell infiltration and focal fibrosis. Follow-up CECT scan was done to document two segments of IVC and thus confirm our intraoperative finding [Figure 1]b. The postoperative period was uneventful, and the patient was discharged on the 3rd postoperative day. DJ stent was removed at 6 weeks of surgery. A transcaval ureter results from anomalous development of the IVC and not from anomalous development of the ureter. “Supracardinal model” theory is the most accepted theory for the development of IVC. 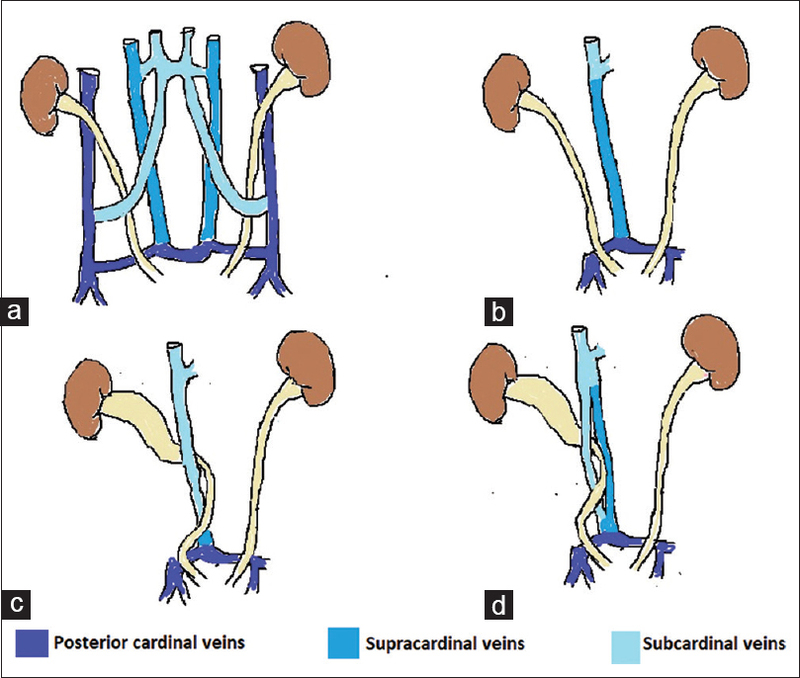 This model suggests that the retroperitoneal venous system develops from three paired fetal veins, namely posterior cardinal and supracardinal veins which lie dorsally and subcardinal veins which lie ventrally [Figure 3]a. During embryological development of IVC, normally the left supracardinal veins and the lumbar portion of right posterior cardinal vein atrophy. The subcardinal veins become the internal spermatic veins and right supracardinal veins form the definitive right-sided IVC [Figure 3]b. If the subcardinal vein or the lumbar part of posterior cardinal veins fails to atrophy and becomes the primary right-sided vein, the ureter is trapped dorsal to it, resulting in the formation of retrocaval ureter [Figure 3]c. Transcaval ureter results from persistence of the right posterior cardinal vein together with the right supracardinal vein in postrenal position. This creates a double IVC, both on the right side, with the ureter passing through the venous ring formed by it [Figure 3]d.
Transcaval ureter has been reported to have a prevalence of about 0.9 in 1000 (one in 1100) with a male-to-female ratio of 2.8:1. Symptoms, when present, are mainly related to ureteral obstruction, which is a frequent but not an inevitable complication. In transcaval ureter, the ureter crosses posterior to the IVC and then travels medially and anteriorly to partially circumscribe the IVC. The findings at IVU may suggest transcaval ureter but are not diagnostic. Patients with transcaval ureter present with the complaint of right flank pain which usually increases with fluid intake. They may have associated recurrent episodes of urinary tract infection, increased urinary frequency, and hematuria. The first investigation is ultrasound scan which will suggest hydroureteronephrosis. On IVU, retrocaval ureter is characterized by hydronephrosis and extreme medial deviation (“fish hook deformity”) of the middle ureteral segment where it passes behind the IVC, usually at the L3 vertebral level. In transcaval ureters, the deviated portion of the ureter splits the IVC and therefore courses less medially than in retrocaval ureters. In addition, the level of obstruction may be slightly more cephalad or caudad. The preoperative diagnosis of this entity is made by CT scan or venacavography, rather than by urography. Although a rare anomaly, transcaval ureter should always be considered when intravenous urogram suggests retrocaval ureter. Lautin et al. found on CT scan that lateral placement of the IVC occurred in all the cases of transcaval ureter and in only 6% of the cases without transcaval ureter. Therefore, they suggested that finding of a laterally placed IVC on CT is suggestive but not pathognomonic of transcaval ureter. Although treatment of transcaval ureter generally comprises conservative management, the presence of severe pain or complications, such as recurrent urinary tract infections, impaired renal function, and urolithiasis, necessitates surgical correction. Surgical management involves resection of the ureter and an ureteroureteric anastomosis anterior to the IVC, which can be performed both by open method and laparoscopically. Our patient presented with a history of recurrent episodes of right flank pain which had increased in intensity over 6 months. A diagnosis of transcaval ureter was made at the time of surgery. Right ureteroureterostomy was done after resection of the involved transcaval segment of the ureter. Transcaval ureter has been described as a rare embryological IVC anomaly and a unique cause of ureteric obstruction. It should be kept in mind for differential diagnosis of right flank pain. Imaging modalities, such as CT urography, play an important role in the diagnosis of transcaval ureter. This subsequently facilitates appropriate timely management to prevent the complications of obstructive uropathy. The authors would like to thank the patient for giving consent and cooperation. Rosen MP, Walker TG, Brennan JF, Babayan RK, Greenfield AJ. Transcaval ureter with hydronephrosis: Radiologic demonstration. AJR Am J Roentgenol 1989;152:793-4. Giddy S, Thangasamy I, Vega Vega A. Transcaval ureter: A rare embryological anomaly causing obstructive uropathy. BMJ Case Rep 2015;2015. pii: bcr2014208076. Lautin EM, Haramati N, Frager D, Friedman AC, Gold K, Kurtz A, et al. CT diagnosis of circumcaval ureter. AJR Am J Roentgenol 1988;150:591-4. McClure CF, Butler EG. The development of the vena cava inferior in man. Am J Anat 1925;35:331-83. Bass JE, Redwine MD, Kramer LA, Huynh PT, Harris JH Jr. Spectrum of congenital anomalies of the inferior vena cava: Cross-sectional imaging findings. Radiographics 2000;20:639-52. Johansson NT, Nilsson S, Scherstén T, Schvarcz J, Weiland PO. Retrocaval ureter. Report of a case and short review of the literature. Scand J Urol Nephrol 1969;3:53-8. Shown TE, Moore CA. Retrocaval ureter: 4 cases. J Urol 1971;105:497-501. Bateson EM, Atkinson D. Circumcaval ureter: A new classification. Clin Radiol 1969;20:173-7. LePage JR, Baldwin GN. Obstructive periureteric venous ring. Radiology 1972;104:313-5. Philipps E. Embryology, normal anatomy and anomalies. In: Ferns FJ, Hipona FA, Kahn PC, Philipps E, Shapiro JH, editors. Venography of the Inferior Vena Cave and its Branches. Baltimore, MD: Williams & Wilkins; 1969. p. 1-32.